That statement has always spoken to me, to not make excuses but to make an effort to move in the direction I want to go, in whatever aspect and capacity of life to which I wish to apply it. There was a film director that I met one time, and she made her mark in films way back when she was getting started by loading up her van with her camera and limited equipment, a skeleton crew and a very few actors, and heading off down the road. When she saw a likely spot, they all got out and proceeded to shoot some scenes for a film, right where they were at. She ended up with some good films. She eventually was asked to direct a well-know television series as a guest director, and they wanted her to do her “guerilla directing” thing with the big show, but she couldn’t be spontaneous when it took 4 semi-truck loads of equipment to shoot one little scene for that big show. But I digress. Roosevelt’s statement also applies to gardening. After spending a spring wishing and hoping for warm weather and that the rain would cease to fall in excessive amounts, I think I am finally past it. I can wish and hope all I want, but the fact is it appears that this growing season is going to be quite similar to last year’s growing season, which was short and cold. 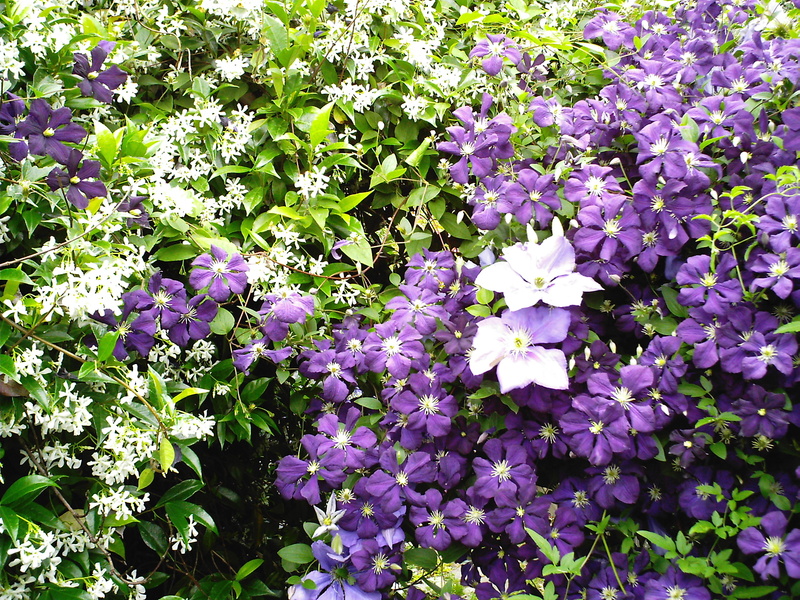 This is a not a bad combination for my flowers, which are doing great and growing well. It could spell disaster, however, for my vegetable garden. But, what I have going into this, and to my advantage, is the knowledge of the growing season last year. This will help me to get into what I have been calling “guerilla gardening” mode, to help me get some kind of a reasonable vegetable crop from my garden this year. Here are some tips that I am using with my vegetables this year, and I hope that they might help you as well in your gardening pursuits. 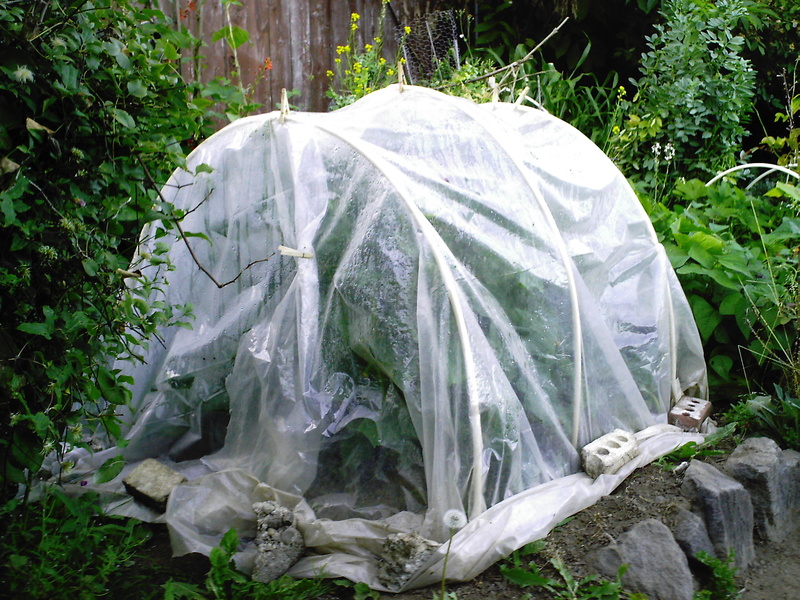 Grow warm-season plants under plastic. Let’s face the facts, shall we? Where I live in SW Washington state, it has not reliably hit 50 degrees air temperature at night yet, on June 21st. On and off, but not consistently. It needs to be at least 50 degrees, and preferably 55 degrees overnight, before tomatoes will ripen–their ability to ripen, mature and turn red is based much more on the nighttime temperatures than the daytime. What this means is that I am looking for ways to increase the nighttime temperature around my tomatoes. 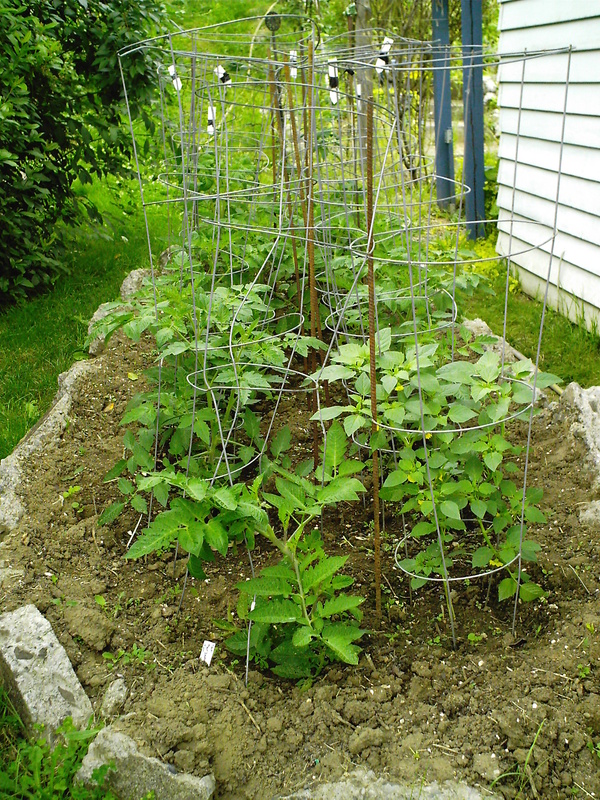 I have planted my tomatoes, and placed tomato cages over them, then I put clear plastic over the top and sides of the cages, holding down the edges with rocks. This plastic will raise the nighttime temperature by 3-4 degrees, which will help bump it up to at least 50 degrees, if not a bit more. 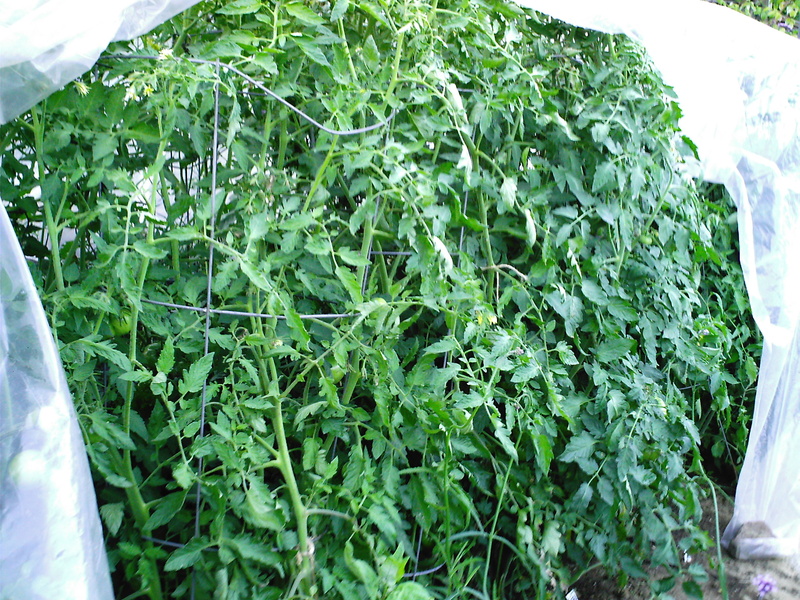 This will help your tomatoes ripen a lot faster than if they were uncovered. Last year, I asked most of the farmers who had ripe tomatoes at the farmers’ market how they got their tomatoes to ripen, and nearly all of them, with farms located in this area, said that they had to cover them with plastic to get them to ripen, so that is what the professionals are doing. 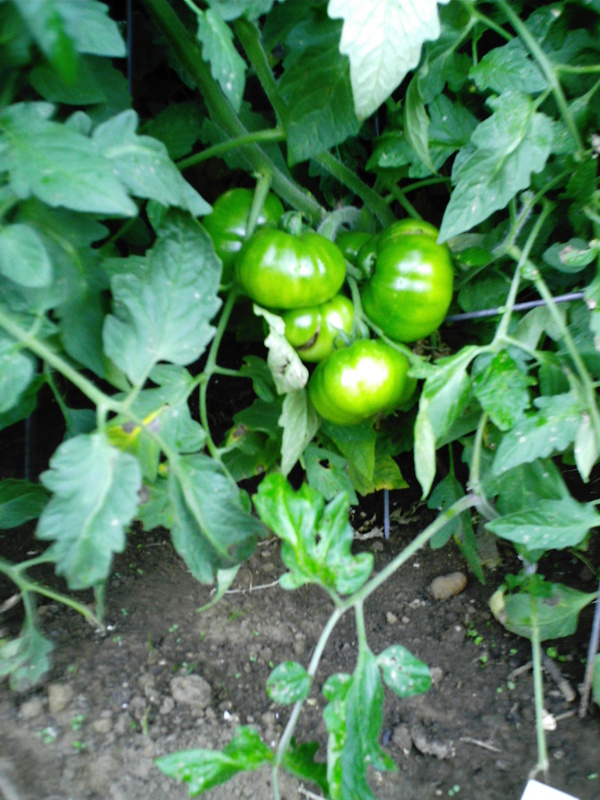 Rain and any kind of water falling on the fruits is also another big enemy of a perfectly ripe tomato. 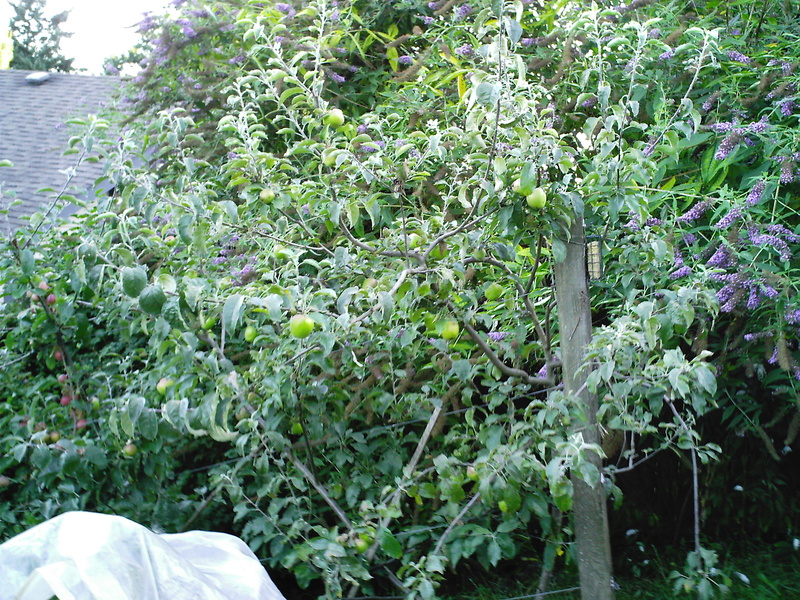 You want to keep rainfall off the tomato fruits as much as possible, or they rot very quickly and have lots of blemishes. Plastic is very good for this purpose as well. I also pretty much gave up growing the tomatoes that are late-season varieties–only one ‘Brandywine’ plant this year, for example, and more of the quicker cherry tomatoes. 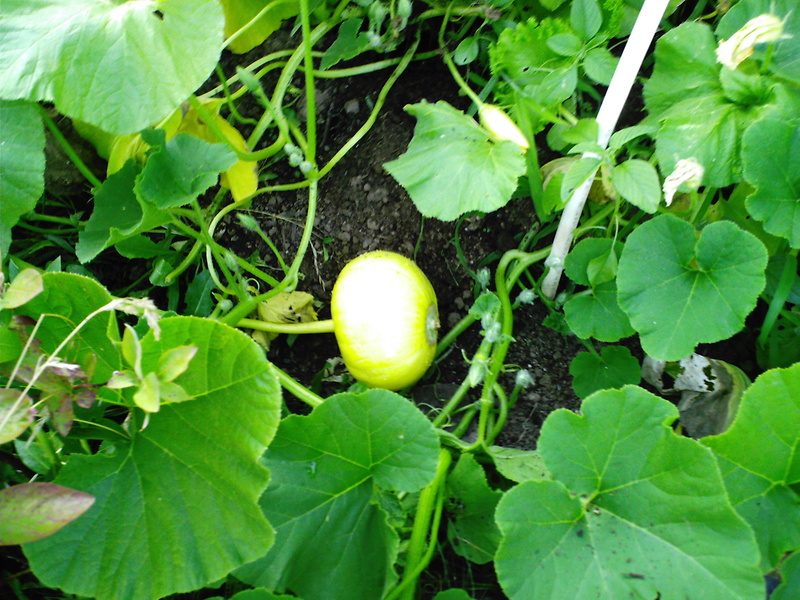 It gets worse if you want to try to grow cucumbers, eggplant and peppers, or any of the melons. These plants need 60 degree temperatures at night in order to mature. For these, put hoop houses over your planting beds. If you use PVC plastic pipe, found at a hardware store, and push it into the ground over your plants, it will form a half-circle, or a hoop. On these hoops you can place clear plastic and hold it down with rocks at the corners, and clothes pins on top of the hoops. The idea is that you don’t want the plastic to touch the plants. Water condenses under the plastic, which helps to keep things moist under there. Unfortunately, this will be high maintenance, because eventually July will roll around, and we will get some days that will be in the 80s and 90s. On those hot days, you will need to open the plastic in the morning, make sure everything has enough water so they don’t dry out, and then cover them at night. You will have to decide how much you love cukes, peppers and eggplant, and how much time you have to spend babying these plants, because they will take more work than some of the other things that are easier to grow. 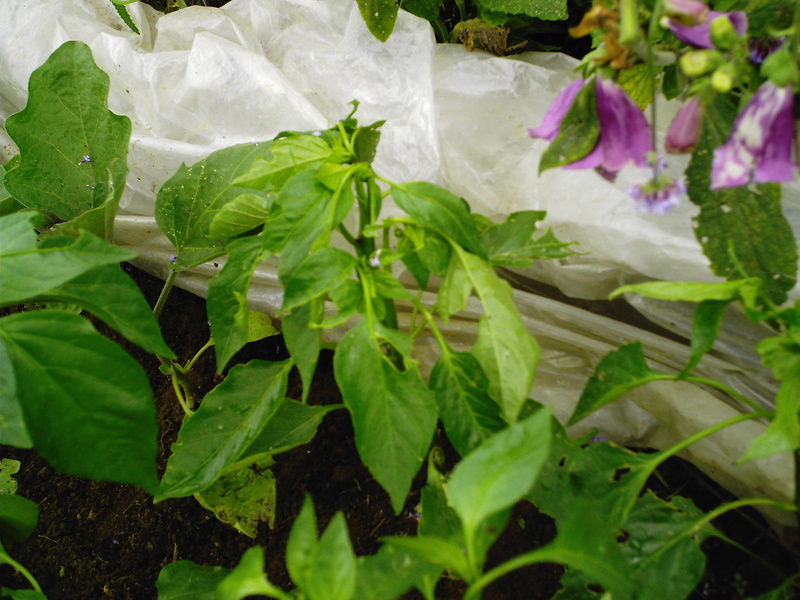 Nearly every local grower at the farmers’ market last year who had ripe peppers for sale had to cover them with plastic to get them to turn red. Just sayin’. And every variety of eggplant, pepper and cuke that I grow are suited to short growing seasons, because those that need a long growing season will never ripen before we start getting colder autumn weather. This is pretty hard with cukes, because I want to get as much growth as possible under plastic, to increase the temperature to improve growth, but eventually they get too big, and you have to put a trellis up for them to grow upon, so eventually (I wait until the last possible minute), you will not be able to cover the cukes any longer. Then they have to be big enough to hopefully swim and not sink on their own with whatever the weather hands out. 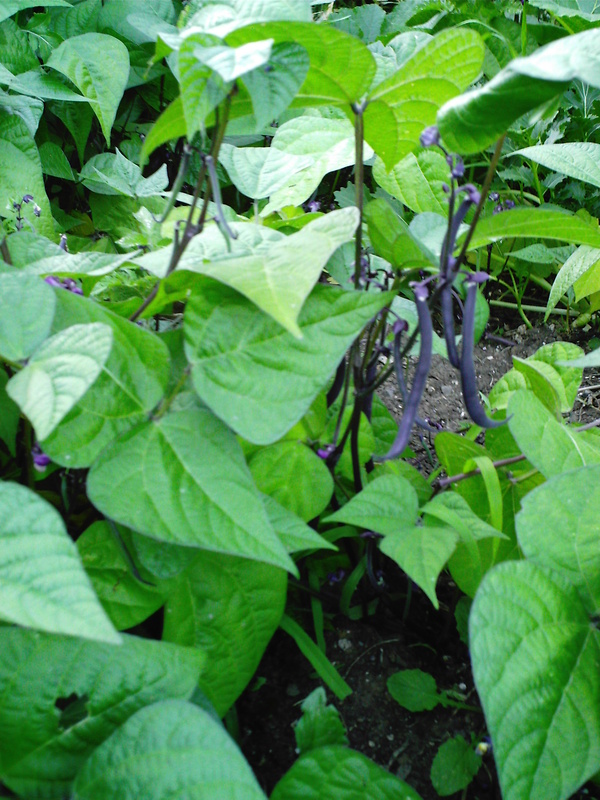 The eggplant and peppers stay covered throughout the entire growing season until they die in the fall. I have never had good luck with melons, so I wish you well if you want to give it a go–just be sure to plant short-season melons, and you might fare better than I. To give them a headstart, I also cover my corn bed, as well as the pumpkin and squash bed, to warm it up for them to get a good start. After the plants get too big, I end up uncovering them, but not until partway through July. So, what can you grow that will not be a pain in the neck for the gardener? 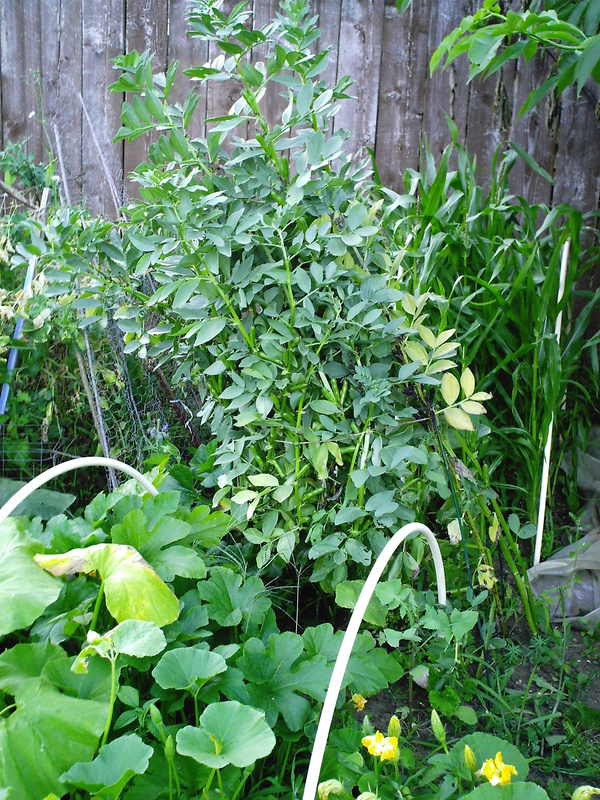 Here are some plants that I had good luck with last year, even though it was a very cold summer: Lettuce, arugula, beets and beet greens, tatsoi, mustard greens, swiss chard, green beans, both bush and runner bean types, sugar snap peas. 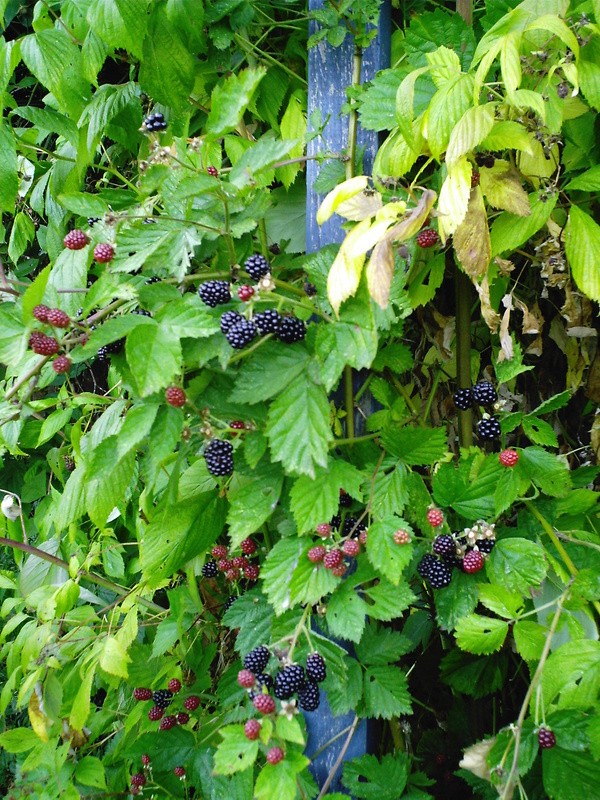 It also appears that we are going to have a bumper crop of blackberries, raspberries and marionberries this year as well, without much work on my part. (The bees have been very busy, on the other hand, polinating all those flowers for me.) 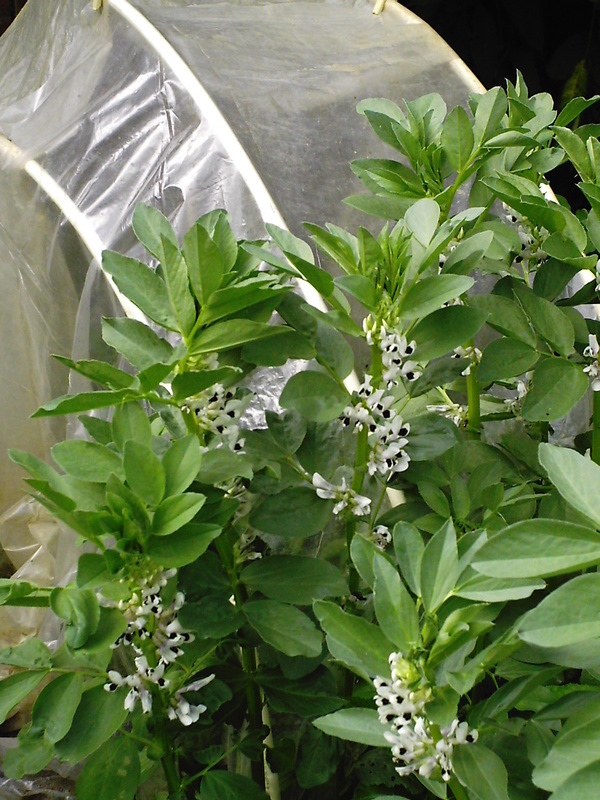 If you want a garden that you don’t have to cover with plastic, you might want to focus on these crops that will grow just fine in cooler temperatures. And that is totally an okay thing to do–why fight nature? It is a fight very difficult to win, so why not go with what gets handed out and make it easy on yourself? I have no problems with that. 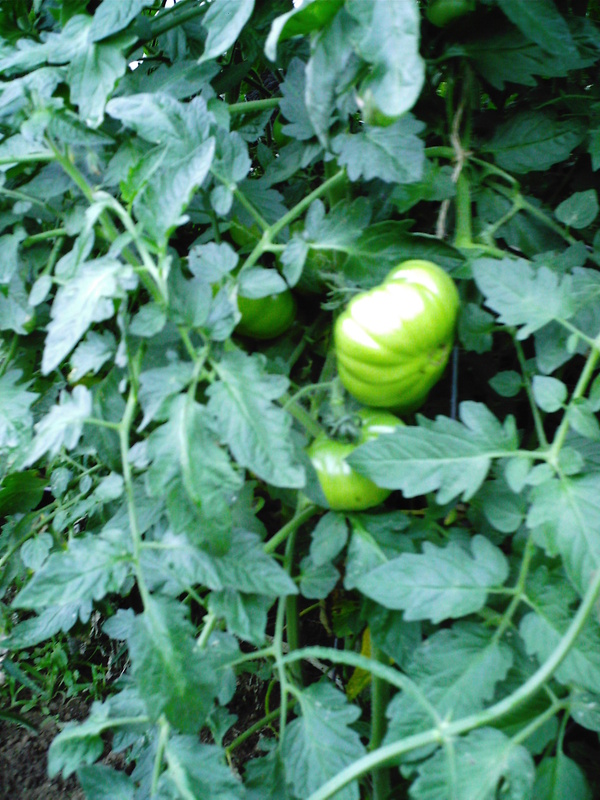 It is just that I love, absolutely live for, home-grown tomatoes, and so I am willing to take the extra steps in order to get some of our own. 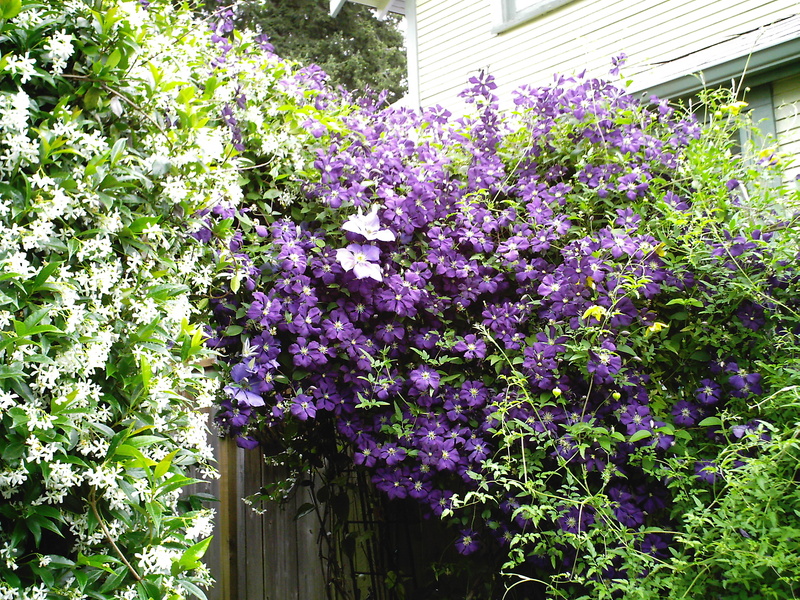 (I am also someone who monkeys around with fussy delphinium plants that need to be protected from slug attacks and need to have each bloom stem individually staked–you love what you love, what can I say.) 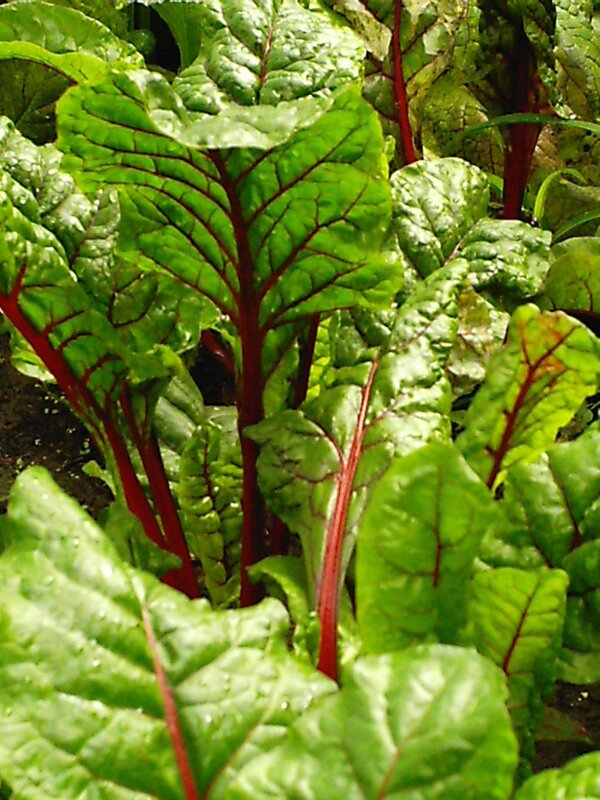 Another option is to purchase those warm-weather crops from farmers that are coming over from sunny and dry Eastern Washington and Eastern Oregon to the farmers’ markets to sell their wares, and then you grow what is easier to grow in your garden–this works very well, too. In addition to colder weather, you might also have a lot of shade on your property due to large trees. 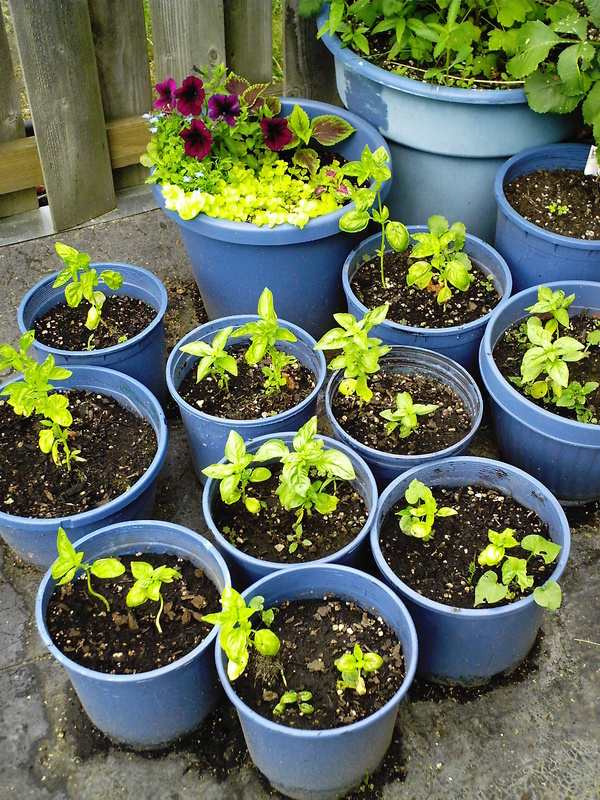 Vegetables need sun, so one solution is to go in for large container gardening. 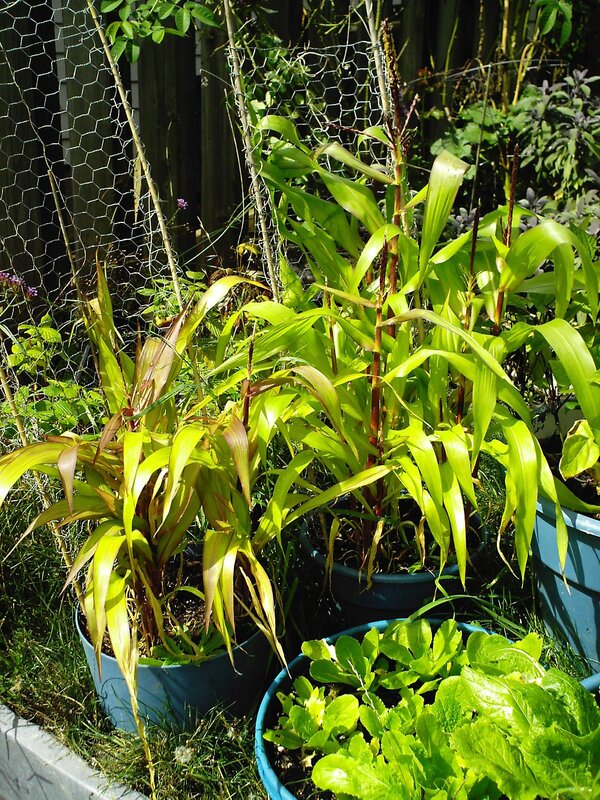 You can grow all sorts of vegetables successfully in large containers. I’ve grown tomatoes, peppers , eggplant, corn, sunflowers, lettuce, beans, peas and cukes in big containers. 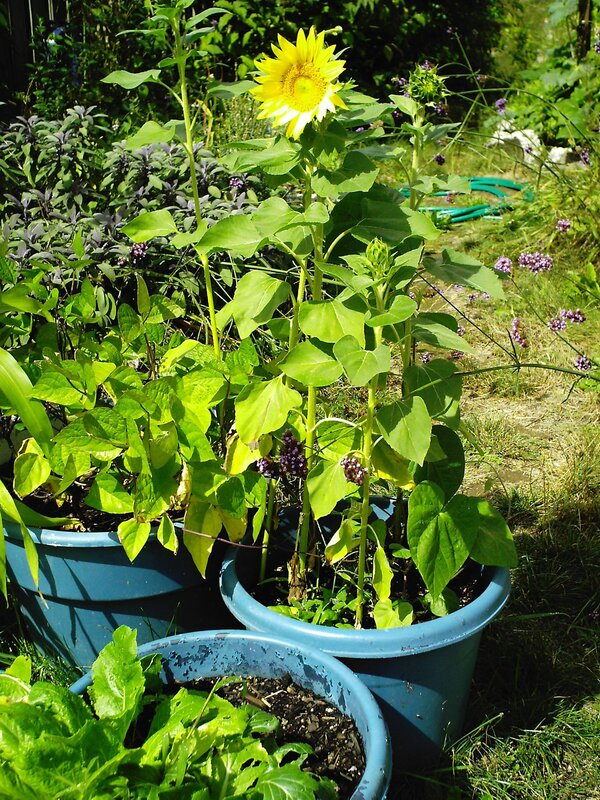 The plants will not produce as much as they would if growing in the ground, but you can place the containers anywhere you have a sun spot, so you will likely have much more success in growing vegetables in this manner. You will discover that the garden hose and fertilizer are your friends if you take this route, which is high maintenance. “Do what you can, with what you have, right where you are.” If you want to vegetable garden this year, then don’t let the weather stop you. Just know what you’re in for, so you can decide how you want to spend your time and energy. And garden smart, like a guerilla gardener would, and you’ll have some success. Do enjoy the first day of summer, the Summer Solstice, today, and visit the Garden Party. I’m super busy right now, and will be until the middle of September. I will try to continue to add some brief posts as I can. This is what I called my “Lone Wolf” sweet pea (remember Lenny “One Wolf” and Squiggy?). It is blooming during 95+ degree weather–go figure. There are some light lavender ones that bloomed after this photo was taken as well. I love sweet peas–so very pretty and delicate flowers. Just a pretty hydrangea growing on the side of the house. I love to use them as cut flowers for a quick and easy arrangement during the summer months. This was planted by previous owners prior to our moving in here, so I have no idea what the specific variety is, but I like it and it is hardy in PNW garden zone 8. I have a lovely hibiscus ‘Sweet Caroline’ that I am anxiously waiting to bloom. It has gigantic hot pink flowers, and is wonderful to see in the declining August beds, so I will try to remember to post a picture of it when it starts blooming. The hummingbirds have been buzzing around the garden. They like the liatris, verbena bonariensis, nasturtiums and petunias in my hanging baskets, an orange crocosmia now in bloom, the last few Lamb’s Ears flowers and other butterfly bushes that are blooming, plus the feeder that I put out for them. How is your garden growing? Leave me a comment–I’m always interested to hear how your gardens are doing! Please visit Oregon Cottage Blog’s Tuesday Garden Party. Now, I know you’re being polite, but you’re probably thinking to yourself, “That bed looks mighty empty.” And I would concur. This is due to my having to replant this bed three times before anything would grow. I did chitted cuke seeds, which worked very well last year, twice, and twice they all died but the one bigger one at the bottom of the photo. I then decided that I should plant plain old seeds in the 90 degree weather we had last week. I kept the bed watered, which you typically are not supposed to do with cuke chitted seeds, and four days later all these babies appeared! So now I have all salad slicing cukes, because I ran out of pickling cuke seed in all the replants, and they are about 2-3 weeks later than they should be. Such is life in my vegetable beds this year. And did I mention that I am a Master Gardener and have been through all the training, and have about ten+ years of vegetable growing experience under my belt? So don’t feel bad if you have problems sometimes in your garden–we all do at one time or another! The trick is to think like a detective and try to figure out how to fix it or do it better or differently next time to get a different result, hopefully a better one. 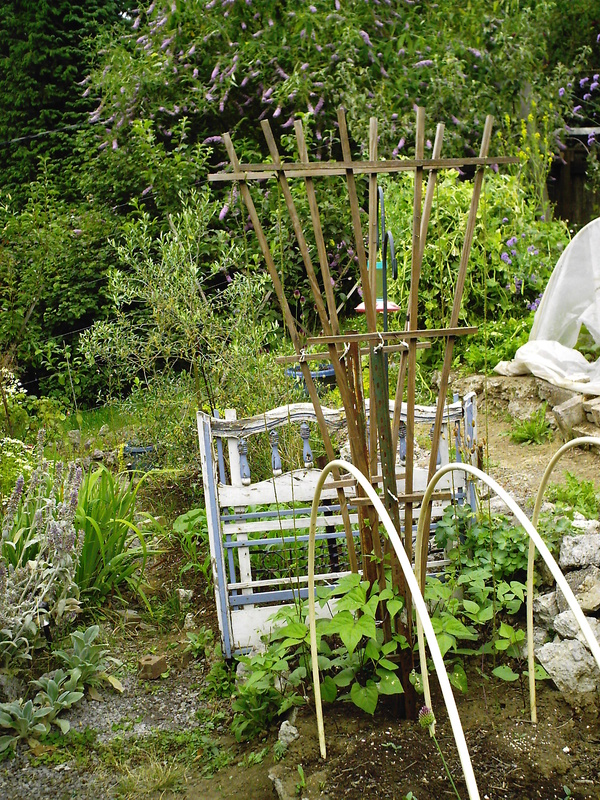 Also, notice I still have hoops and plastic in place–I cover this bed every night it is below 60 degrees or until the plants outgrow the hoop area. 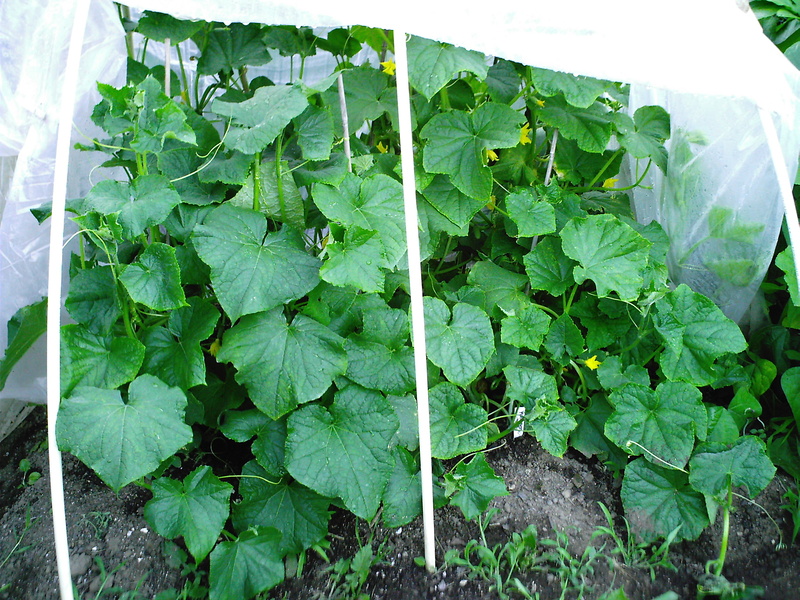 Cukes, eggplant and peppers require it to be 60 degrees at night before they will set fruit and the fruit will mature, so if Mother Nature does not provide that for the plants, you need to do it for them. This is one big reason why people can’t get eggplant and peppers to mature around here–it’s too cold and we have a short growing season because it takes forever for the temperatures to warm up at night in the spring (and this year in the summer until about last week). The only way I’ve been successful with eggplant and peppers is to cover them at night, and then they produce well. Usually. You see those holes and part of the leaves chewed off? That is slug damage. How do I know? Experience gardening here–slugs are notorious for this, and I saw a huge slug on the inside of the plastic when I uncovered this bed today. Remedy: Pick the slugs off when you see them and smash them to bits with a rock. Not the violent type like I am when I see a slug? You can also put out beer traps and Sluggo. A good and cheap slug trap is to get a clean and empty cottage cheese carton or a yogurt carton with a lid. Use an exacto knife to carefully cut slug-sized holes in the upper side of the container(go slow and be careful–easy to cut yourself doing this–don’t ask how I know), then fill it with beer (don’t use non-alcoholic beer–it won’t attract the little devils–alcoholics all–don’t ask how I know), and then put the lid on it. Dig a little hole in the dirt so the holes in your container are level with the soil line, and put the container in the hole. Come back in a couple of days, and there should be drowned slugs in the container, which you can empty in the trash and refill with beer and replace. Hey, at least they die happy. They look pretty good–about where they ought to be for this time of year and when I planted them. 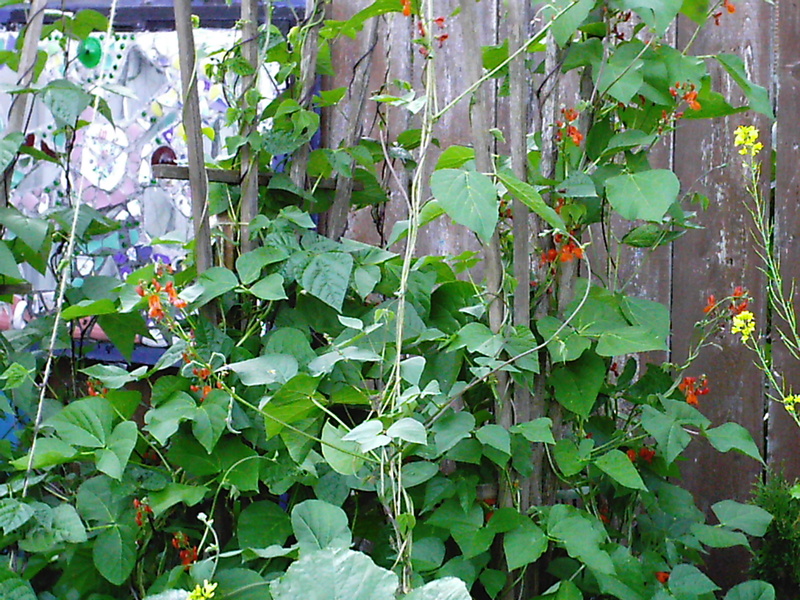 I have both bush beans and runner beans. 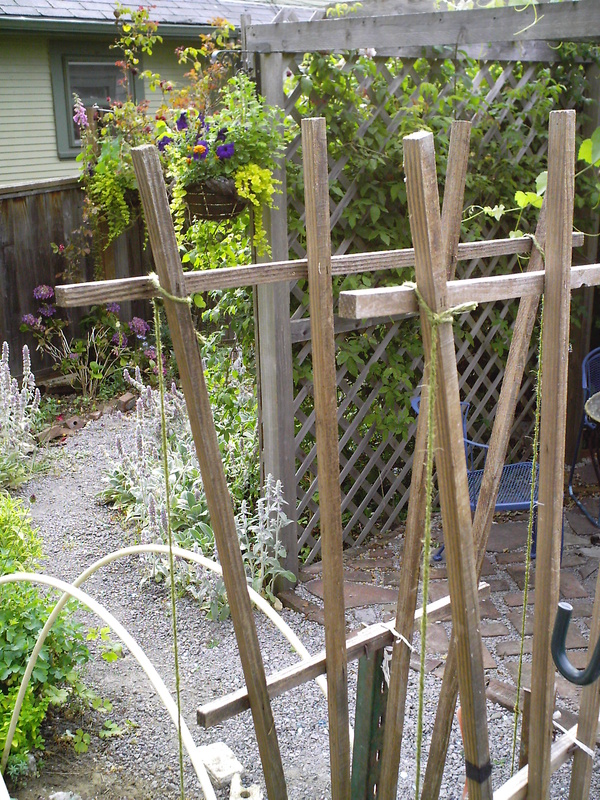 I use what I have to hold those strings taut in the dirt–a heavy wire u-shaped garden staple, or even tent stakes. Tie your string on, and then use a mallet to drive them into the dirt. Easy. 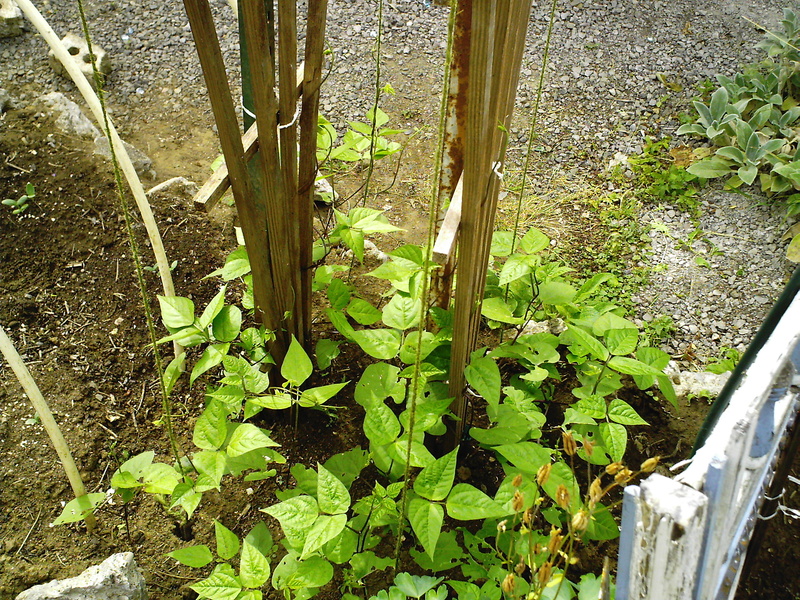 The beans will climb up those strings–you might have to point them in the right direction to give them a little help at first. 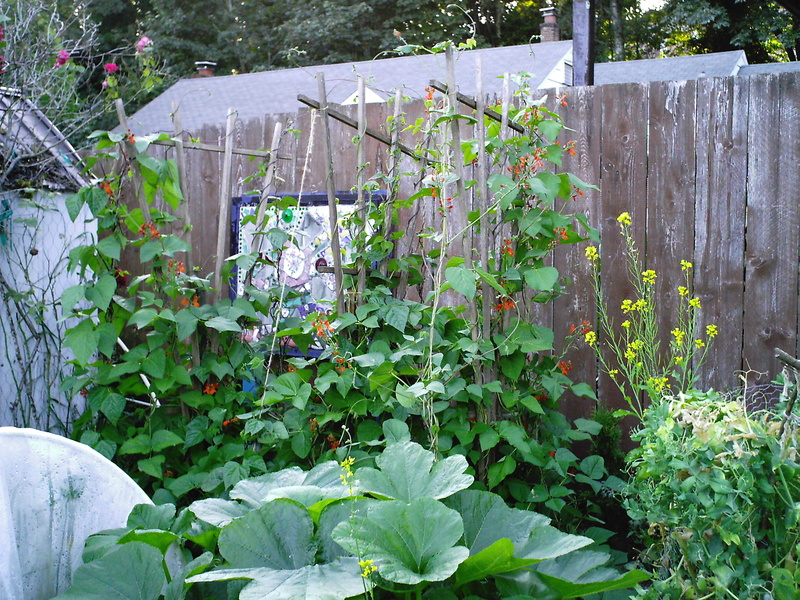 The bush beans are next to the peppers, so guess what I noticed is going on up there? 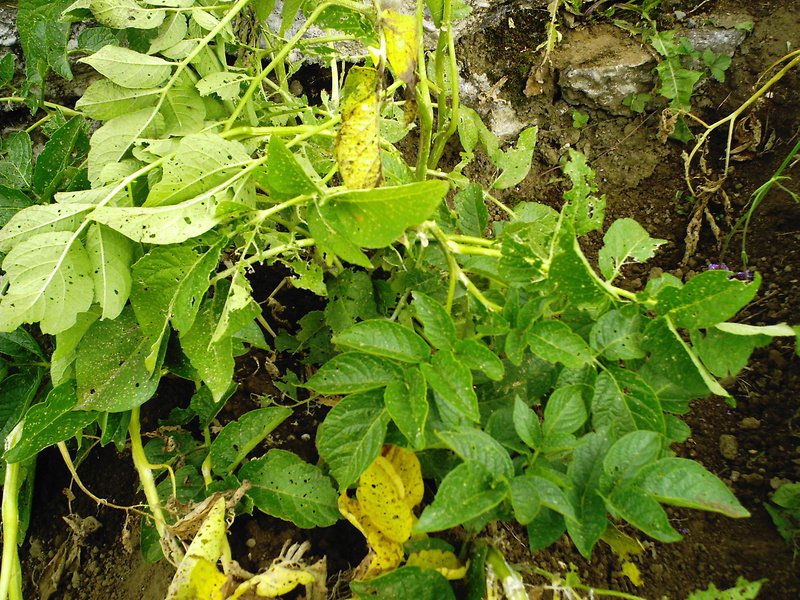 In the bottom-left corner of the photo you will see the telltale holes and unevenly chewed edges on a few of the leaves indicating slug damage. And now you know what to do about that. 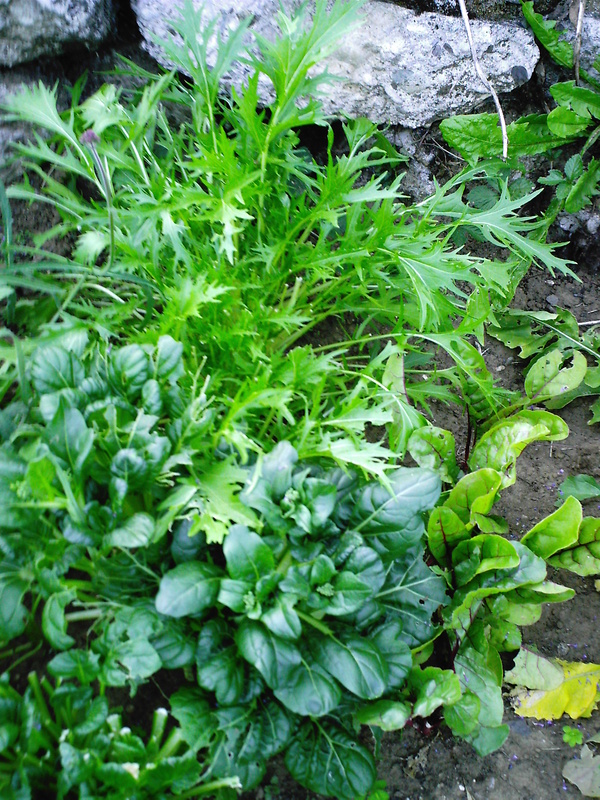 However, you will also notice that most of the plants are clean and look great, so this is a relatively small issue. C’est la vie. I may just sprinkle a little Sluggo around the chomped plant and call it good. Just had room for one little bed, but they are doing as well as can be expected due to the colder weather we’ve had. I would like these plants to be bigger (kind of a recurring theme with me, you’ve probably noticed), but the good news is that they are pest and disease free, which is great–a success story! They would be happier with more sun and warmer weather. (So would I. ) I probably should cover these with plastic, but I took it off because we had company over, and the plastic was pretty ugly. Perhaps an excuse to get some better looking plastic. Is there such a thing? 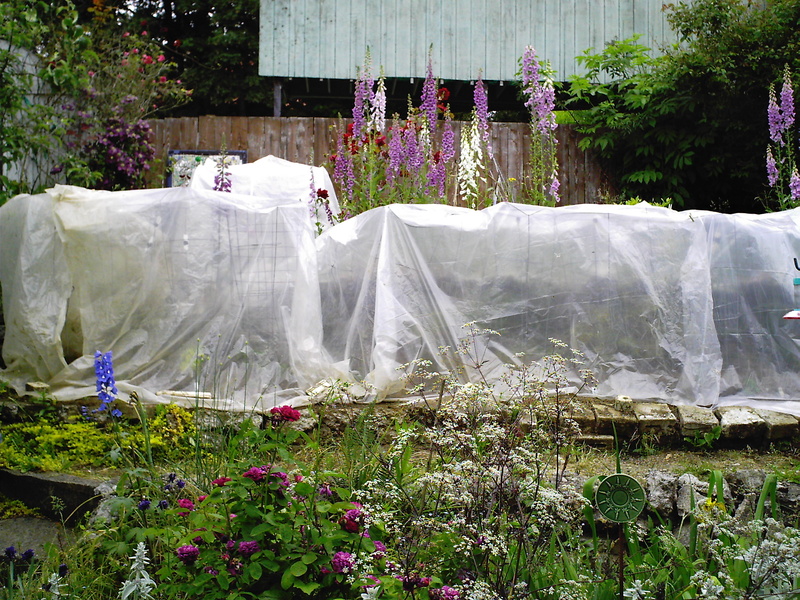 I could also cover them with row covers, but they are quite expensive to buy so plastic it probably will be. They loved the warm weather last week, and shot up! Still, very few have flowers yet, no green tomatoes yet. I have one tomatillo at the end that has some flowers–yay! This is about half of our tomato crop this year. I hope we have a “crop”–come on warm weather! 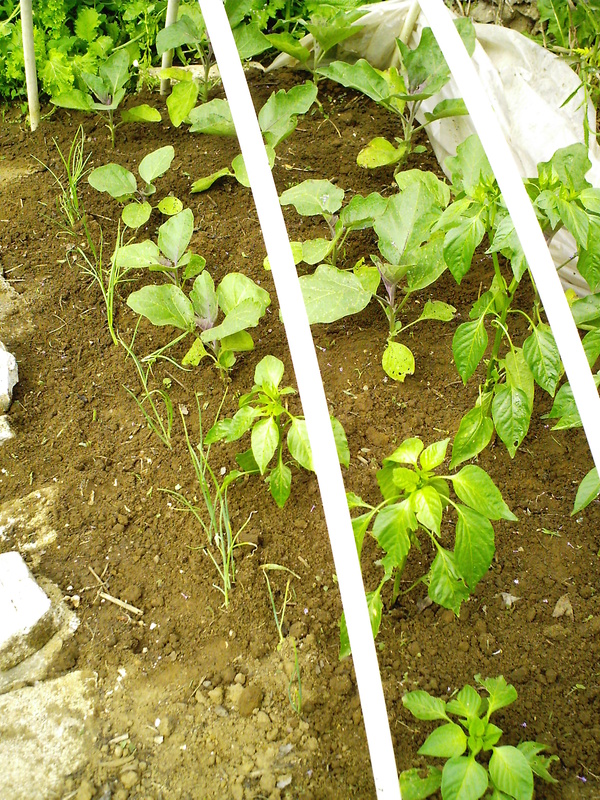 I have had so much trouble with the salad beds this year, beds that ordinarily are really super easy to grow. First off, could not get any lettuce seeds whatsoever to germinate outside. I finally am starting some seed inside under lights so that I can transplant it out. Next, I have planted the mustard greens that will not die. Seriously. We had a warm winter, and I started a bed very early, on Feb. 2nd, of course covered with plastic. We had salad greens to eat for dinner in four weeks! 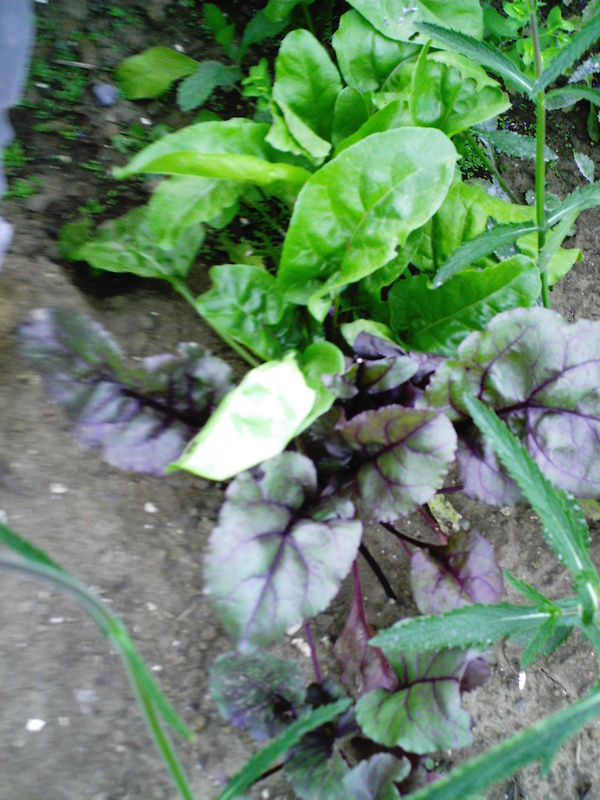 Only thing was, all the the cold-tolerant seeds that I had planted, like spinach, beets, arugula, swiss chard, etc., all had been overtaken by the mustard greens. So I think to myself, not a problem, quit your whining, at least you have salad from the garden in March! So then I started another bed in March with a variety of seed types, and guess what? All mustard greens again. The problem continues, but to a lesser extent now that the weather has warmed up a bit, and I have clued in. I think what was going on is that I used my own homemade compost on the beds, and my guess is that I had composed mustard greens that had gone to seed, and the seed did not die but remained viable over the winter, and then when I added fertilizer to the bed, they said “Yippie!” and shot up, smothering the other plants. I have been trying to be more scrupulous about keeping the beds weeded, but as you can see, I have a lot of beds, and I am the only gardener in the family, so I do my best to keep up, but in all honesty I hate weeding (don’t tell the Master Gardeners–they’ll excommunicate me), and it sometimes finds its way to the bottom of my gardening to-do list. But I do love salad, and so I have been trying to mend my wicked ways. (Notice the gigantic mustard green leering at them from the other bed.) The rows need to be thinned, and I can take the thinned out ones and either replant them in all the empty rows that had lettuce seed in them, or I can put them in tonight’s salad. A win-win situation. And if I am going to be really on top of things, the old mustard greens that have now gone to seed? I will cut off the flower and seed heads and those will go into the trash rather than the compost heap. I did everything right in starting these potatoes. I spaced them correctly(rows should be 36″ apart on the centers). 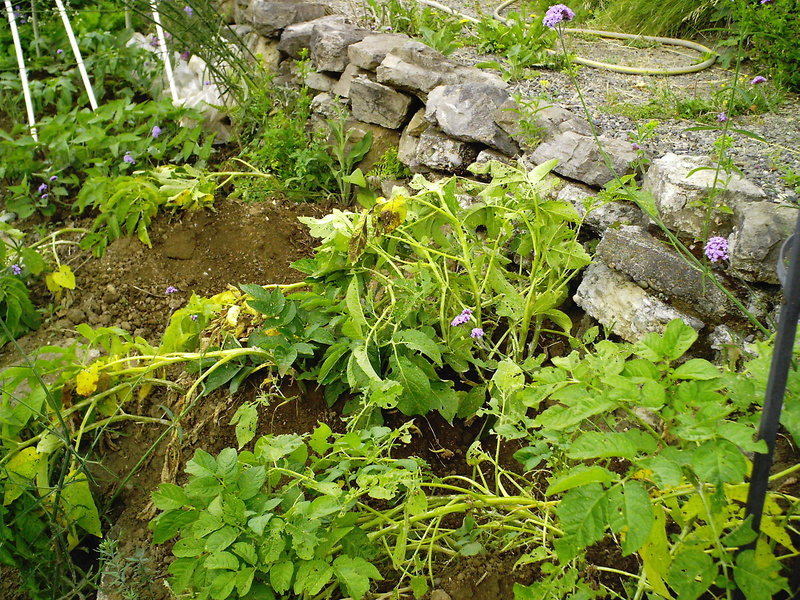 I started with certified clean seed potatoes from a reputable nursery(if you use potatoes that come from the grocery store, you run the risk of introducing the disease called scab into the soil, which is very hard to eradicate once there). 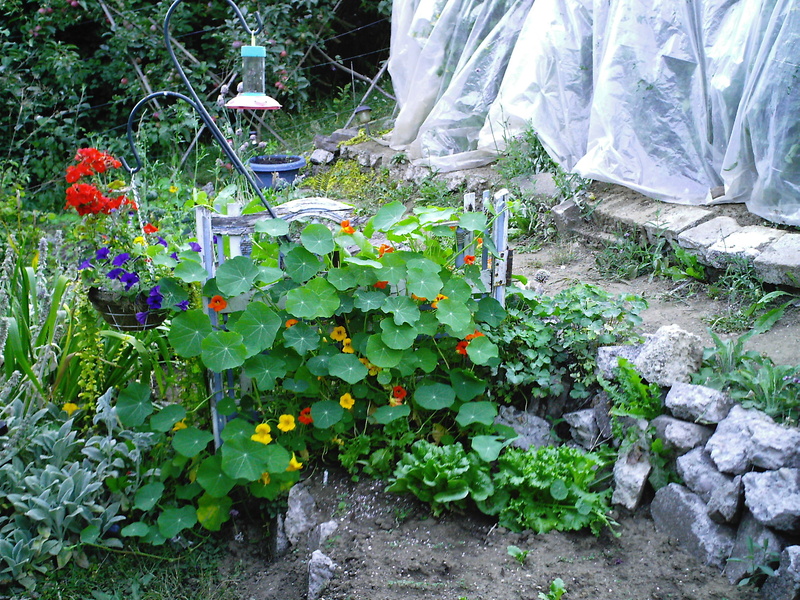 I used the appropriate fertilizer on the hills (which is complete organic fertilizer minus the dolomite lime, or four parts seed or alfalfa meal, one part bone meal and a half-part kelp meal.) I planted them at the right time (when the minimun air temperature is at least 43-45 degrees and the minimum soil temperature is at least 39-41 degrees–I planted on April 20th, but could have done it even a couple of weeks earlier but was too busy). As they grew I hilled them up properly, ending with hills that are about 10 inches tall and about 18 inches wide. What more could a potato ask for? Well, it could ask to not be devoured by flea beetles, apparently. The good news is that it was really hot last week, and I am hoping that put a damper on the flea beetles. I also found out that diatomaceous earth will harm beneficial insects, so then I ran to the gardening center to find something that would work on organically grown vegetables that actually works. I ended up with Captain Jack’s Dead Bug Brew. 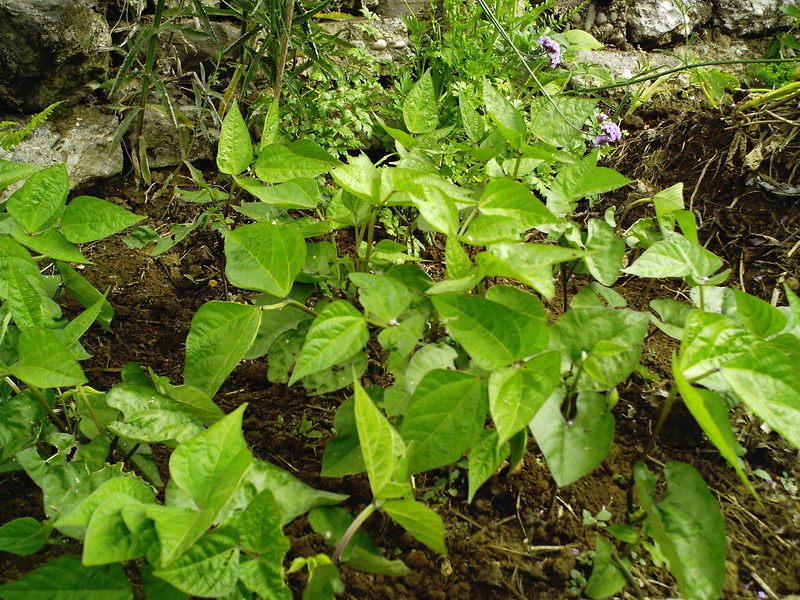 This I sprayed on the tops and bottoms of the potato leaves and vines twice. I think that, plus the warming weather, helped to stop the infestation. I am seeing dark green leaves with almost no leaf damage now. This stuff is not perfect, however, because it can kill bees for up to three hours after application. The good news is that there are no bees around these plants because they have no flowers yet, so the bees were kept safe. I am a little worried that there are no flowers yet–it seems pretty late in the growing season to not have flowers. I guess time will tell with this bed. I will be writing other posts soon about how to troubleshoot problems in your garden, so tune in frequently! I don’t want this to be a complete gardening buzz-kill post, so here are some pictures I took this morning of pretty flowers and other plants. 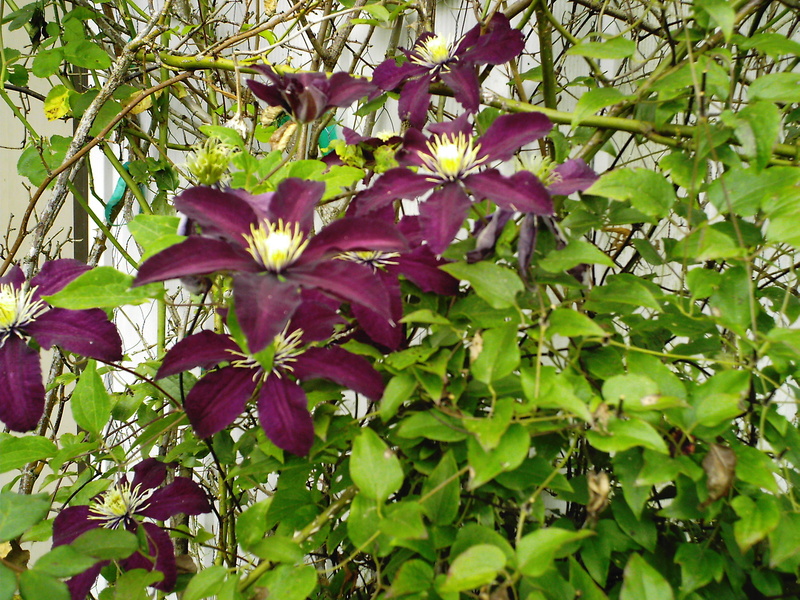 This is ‘Niobe’ clematis reblooming. 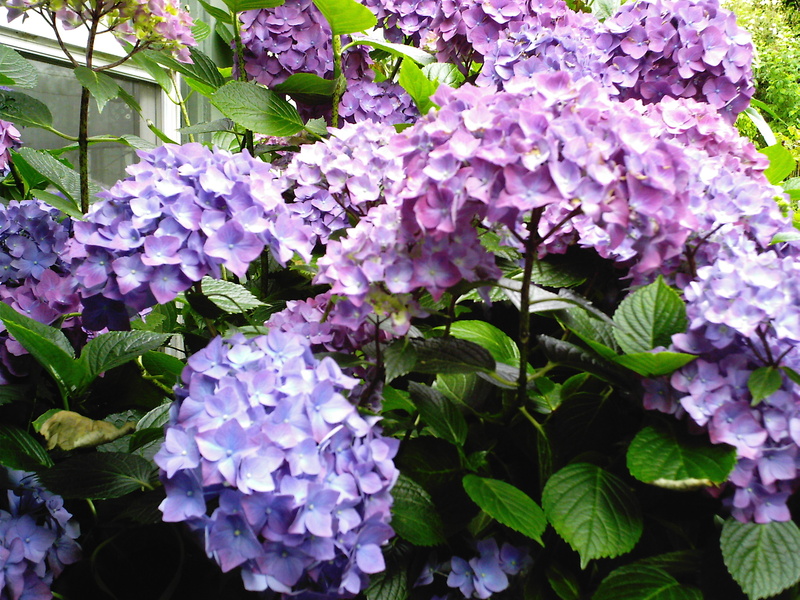 If you keep this one deadheaded, and fertilize once a month, it will usually bloom through September. 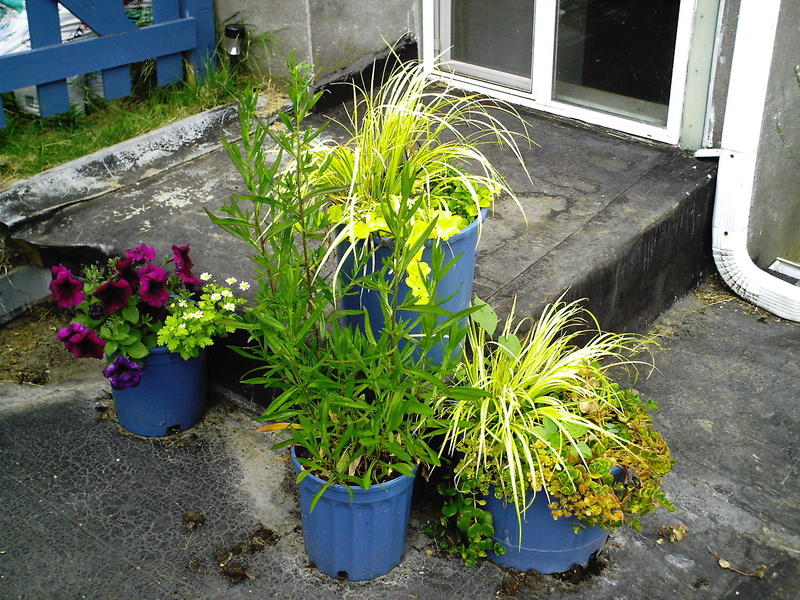 This is the Garage Rooftop Garden. My basil plant flotilla. ‘Genovese’ basil. 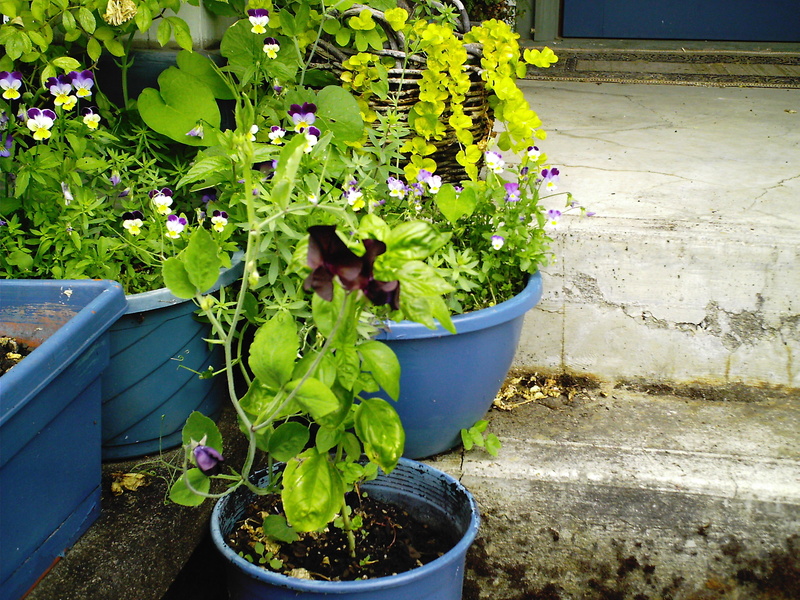 The flower container is filled with coleus that I started from seed, a burgundy petunia, ‘Cambridge Blue’ lobelia that I started from seed, and Golden Creeping Jenny, Lysimachia nummularia ‘Aurea’. That’s all I got. Please visit the Tuesday Garden Party for more gardening fun! My corn seeds germinated yesterday, June 25th. I planted this new variety for me called ‘Quickie’, from Territorial Seeds, on June 18th, so 7 days to germination from planting. It is listed as a sugar enhanced hybrid that is supposed to be mature in only 64 days. 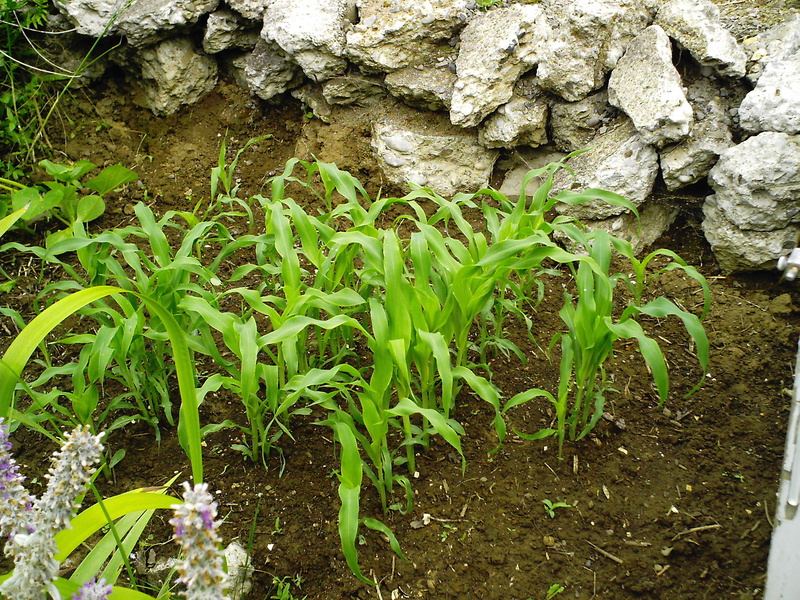 The seed packet says that it has 7 1/2 inch long ears of corn, and that the plants reach 4 1/2 feet tall. This is a bed that I covered with plastic to help heat it up a bit, and that helped this seed germinate. I will try to post a picture of this tomorrow. 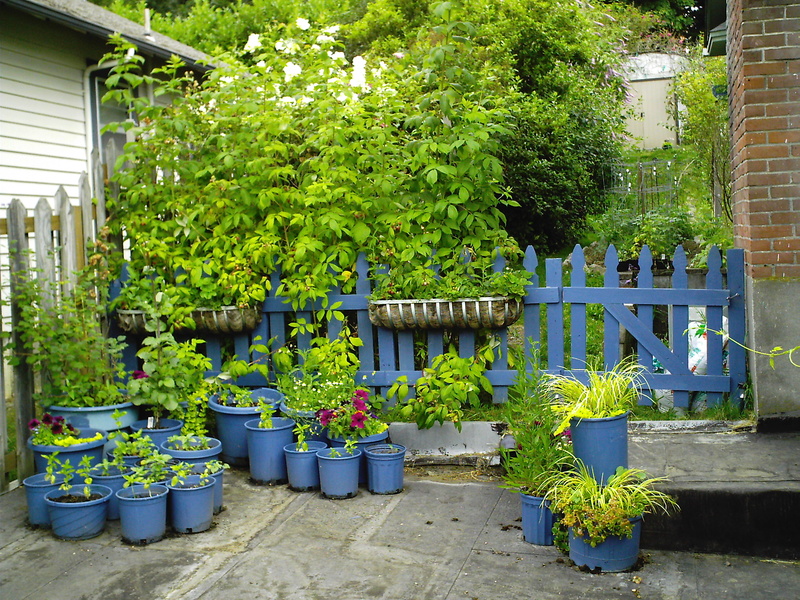 What a gorgeous day it was here–I planted more basil, and just did some tidying of the garden. 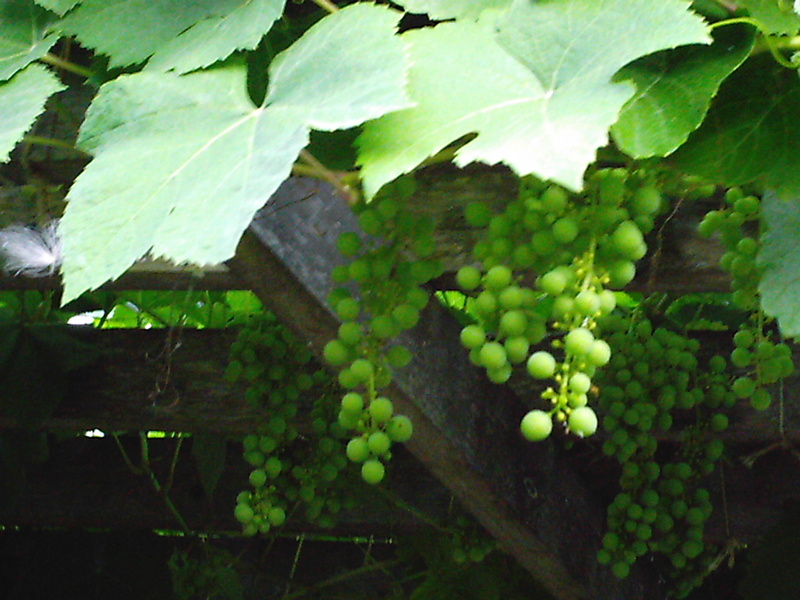 I also sat in the pergola, sipped a glass of wine, and enjoyed the surroundings–I hope you were able to do the same somewhere in your garden! 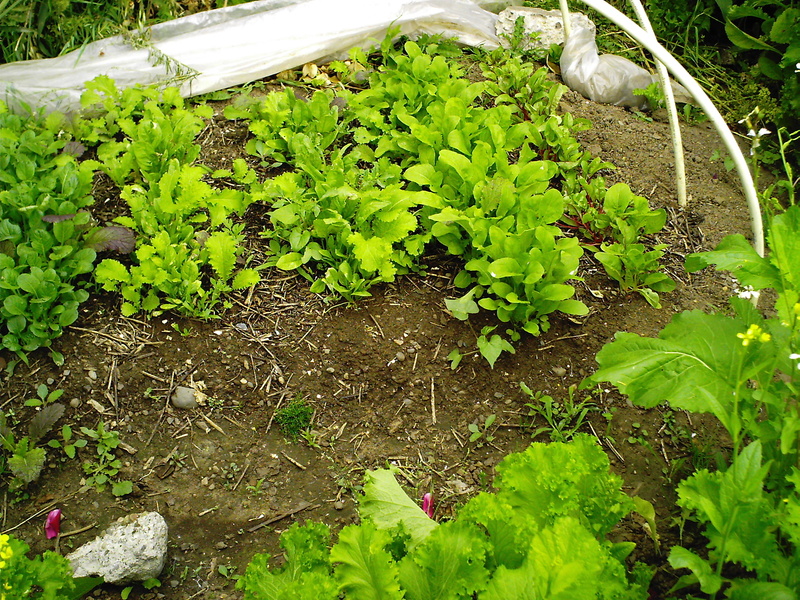 The weather was quite nice this afternoon, and so I dug in and reseeded a lettuce bed that did nothing earlier. Normally I’d put a thin layer of fine compost on the top of the bed, make my rows and plant, but I didn’t have any really fine compost left, so I spread what compost I did have, and on top of where I wanted rows I put seed starting plant mix, which is very fine and light, and then planted the seeds into that. I decided to cover the bed with PVC pipes and clear plastic, just to warm it up a bit and give those seeds a fighting chance. I think I may also be having issues with flea beetles in this bed as well, so as soon as the seedlings emerge, I will dust the whole thing with diatomaceous earth. And Sluggo, as always. I then moved on and planted my chitted cucumber seeds. See how to chit seeds here .I started chitting the seeds on June 11th, they sprouted in the plastic bags by June 16th, but the weather was crummy, so I had to wait to plant them until today, June 18th. In my composted and fertilized bed, I made super-fertile hills that had extra compost and an extra cup of complete organic fertilizer, and worked it into the soil, then I scooped a little bit out of the center of the hill, and put three chitted seeds in every hill, which I will eventually thin to the one strongest plant. This is the method recommended by Steve Solomon in Gardening When It Counts, and I tried it out last year, and had tons of cucumbers. 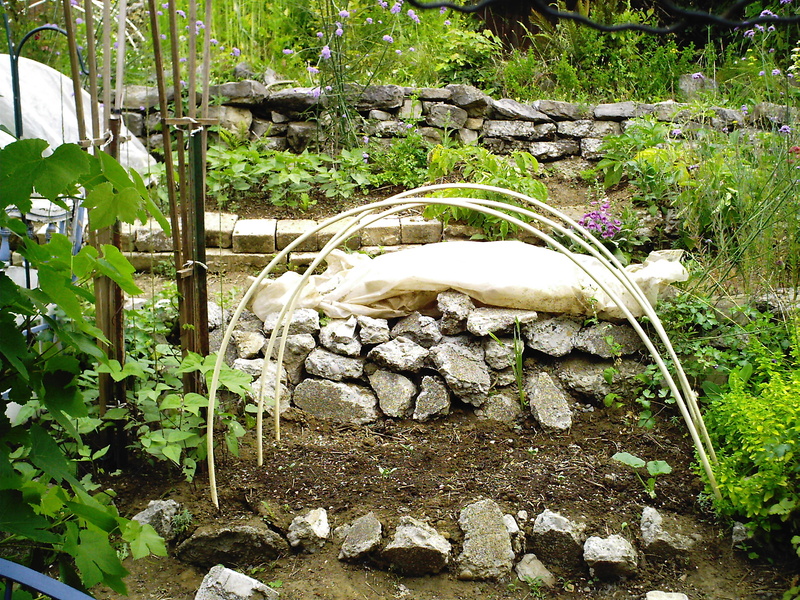 I left room in between my hills for trellises to be placed after the seedlings get growing, but for now I covered the bed with plastic and hoops, because you don’t want the chitted seeds to get rained on until they emerge from the soil. Obviously, Mother Nature is in no mood to cooperate about this, so I covered the bed, which worked for me last year in this same situation. I also planted three kinds of runner beans that have very pretty flowers–‘Scarlet Emperor’, ‘Violet Podded Stringless’, and ‘Trionfo Violetto’, all of which the hummingbirds like as well. 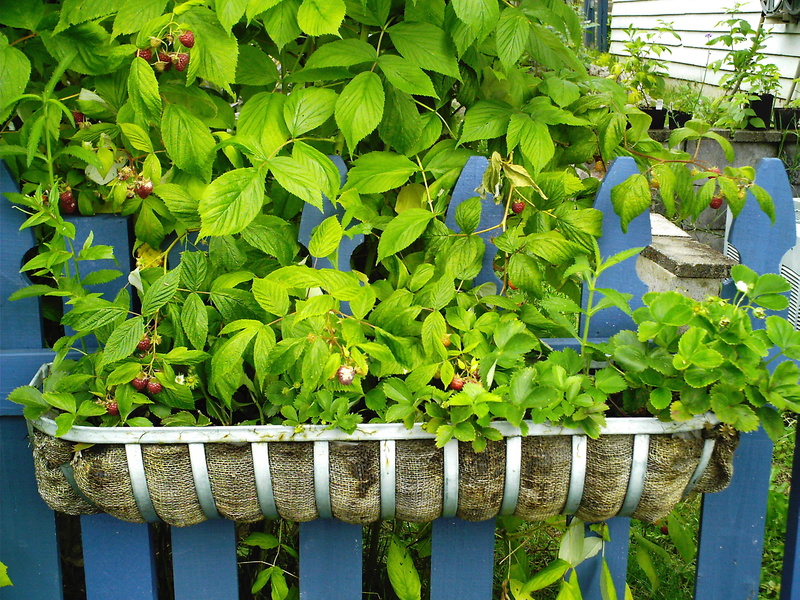 I left room in between the rows to place trellises after they emerge, and, you guessed it, covered the beds with plastic. 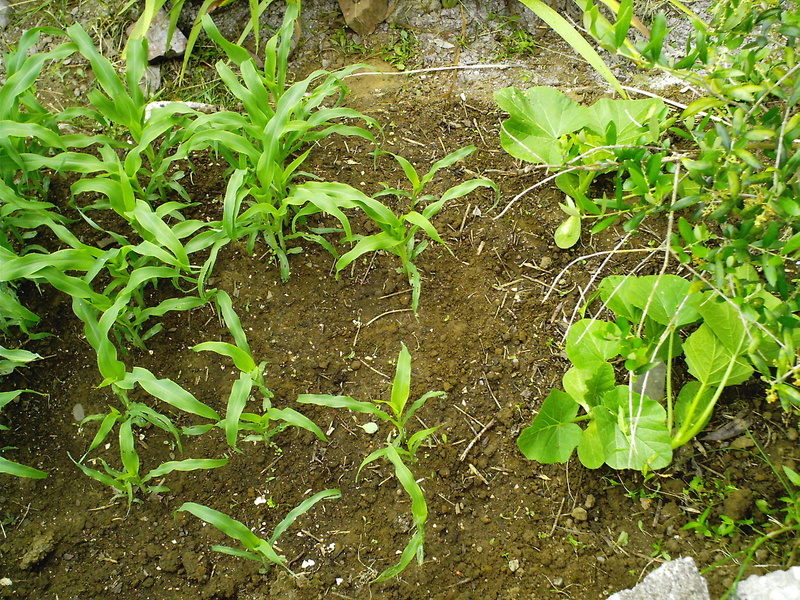 I also planted a small spot with ‘Quickie’ hybrid sugar enhanced corn, and did the plastic cover with them as well. Beans and corn like warm weather, and since it’s cool, this will hopefully help to warm things up for them. About half-way through planting the beans and corn, it started raining, so I was none too soon in getting these things in the ground. In all honesty, my beautiful tomato starts that I planted out on June 3rd are looking a little worse for wear due to sun deprivation, so I put plastic around the tomato cages–I probably should have done this earlier. Surely it will warm up soon–we’ve had, according to my records at our place for the month of June thus far, eleven days out of eighteen with rain. Only four days out of eighteen with actual sun. Onward and upward, fellow gardeners!